Not many plants break the rules when it comes to flower colour. Fewer still manage to do it successfully:’ blue’ roses for example. Just occasionally one stumbles upon a flower which does things differently and succeeds; let me introduce you to Iris reticulata ‘Katherine Hodgkin’. To begin with, the background of her petals are an unusual acidic primrose, more green than yellow. Then come flashes of saffron yellow and delft blue, layered on in painterly strokes. These petals are known as the ‘falls’ and the area of deepest colouring as the ‘signal patch’. Each bloom has raised central petals, or ‘style arms’, which are a delicately veined powder blue. The whole flower has an alluring air of antiquity, as if it had started to fade from an earlier brilliance. To my mind the combination is utterly unique, very beautiful and best appreciated in isolation from other flowers; then, beauty is in the eye of the beholder. What do you make of Miss Hodgkin? 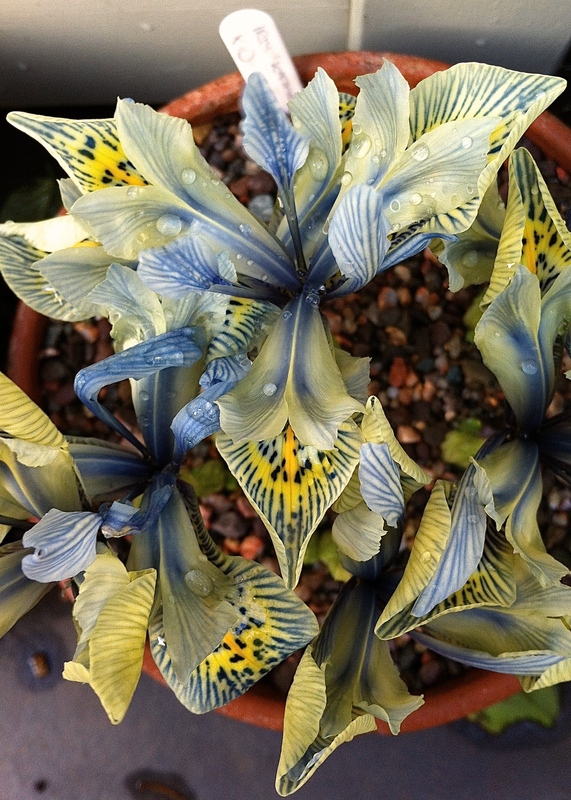 More images of Iris reticulata ‘Katherine Hodgkin’. I love her and I love her close relative ‘Sheila Ann Germaney’ which is very similar but with a narrower strip of yellow. It is such a lovely blue and yellow colour combination. Katharine keeps going for several years in the garden too unlike many of these little Irises. I’d not heard of Sheila Ann, but have looked her up and she looks very pretty indeed! Thanks for that tip. I have my bulbs in a pot, but might try planting them out in the garden once they have finished flowering. She is a true beauty and I’ve got her sprinkled all over the gardens! How lovely that must look. I imagine amongst aconites and snowdrops she’d look lovely, especially at this time of year when there is so little flowering. Thank you Helen. She’s a sturdy little thing, taking everything the weather can chuck at her at the moment! It’s crazy isn’t it? Tonight there are 14 red flood warnings for the south of England and the water is still rising. There you have the opposite, which sounds equally horrendous. I am keeping my fingers crossed for you that the fire stays away. With no frost this year the aggies are still looking superb, but I don’t think they can take a lot more rain. Does anyone know who Katherine Hodgkin was after which this lovely flower was named. I’ve tried Google search but know luck!